As God's child there is nothing in the Truth of God to depress you, defeat you, discourage you, or deflate you. The Truth will build you up, lift you up, and keep you up. The Truth has come to deliver you, free you, heal you, restore you, refresh you, revive you, and renew you. Truth brings you the light of God, the wisdom of God, the ways of God, the plan of God, and the heart of God. Truth is the belt that is tied around your spiritual armor to keep it in place; it is the revelation of true goodness that draws your heart to the Father's love; it is the burning lamp that guides your feet on your pilgrim's journey; it is the plumb line of righteousness that directs your obedience; it is the foundation of your faith and the road map that leads you through the gates of salvation; it is the light in your spirit that brings you into worship and wonder; it is the mirror that your soul gazes into as you are beautiful in His holiness; it is the protective servant that keeps you and prepares you to be Jesus' bride. 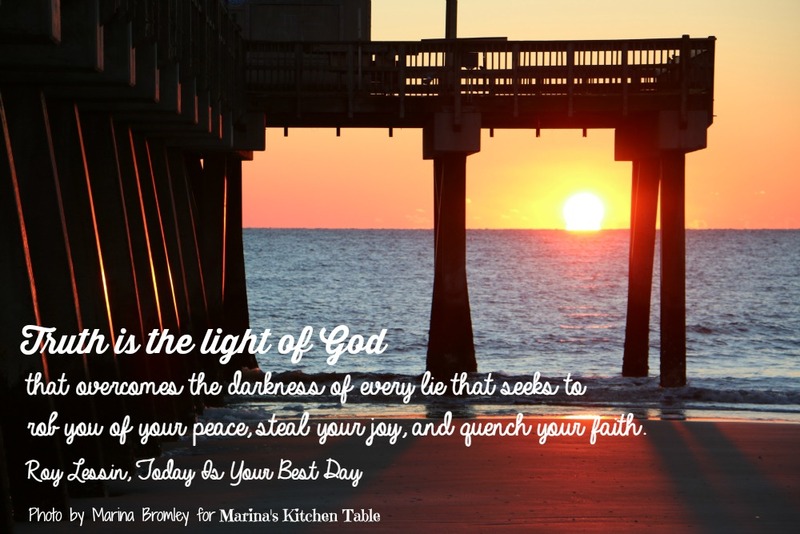 Truth is the light of God that overcomes the darkness of every lie that seeks to rob you of your peace, steal your joy, and quench your faith. When the lie says, "God is not interested in you," the Truth says, "Cast all your cares upon Me, for I care for you." When the lie says, "God is against you," the Truth says, "Because God is for you, no one can be against you." When the lie says, "How could God love someone like you?" the Truth says, "God loves you with an everlasting love." Today is your best day as you know the Truth, receive the Truth, believe the Truth, obey the Truth, love the Truth, and embrace the Truth. Today, the Truth will set you free.